Despite having his rookie season cut short with a gruesome knee injury, Carlos Santana looked as good as advertised in his 46 major league games. After hitting .316/.447/.597 in 57 minor league games, the young catcher compiled an .868 OPS in 192 plate appearances for Cleveland. Although his batting average was just .260, Santana had an on-base percentage over .400 (.401). This is because he walked an amazing 37 times in 192 appearances (19.3%). It is somewhat unfair to label a player a bust when his season ends after just 33 games due to a major knee surgery. But even before the injury, Grady Sizemore was not producing like a top-level outfielder – the spot where most people drafted him this year. As mentioned, Sizemore played in just 33 games. In those games, he hit just .211/.271/.289. This comes on the heels of 2009 in which he hit just .248/.343/.445 in 106 games, itself a huge step-down from his prior superstar performance. He’s a high-upside pick next year, but given the risk, don’t overbid. 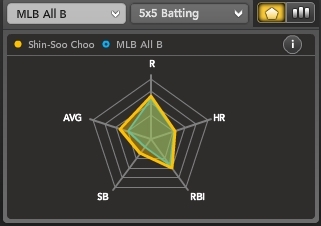 Not only is Santana a really good hitter with ridiculous on-base skills, he does it from one of the least productive positions in baseball. The average OPS for a major league catcher this season is .702, the second-worst mark for any position on the field (shortstop .696). In his brief time, Santana posted an OPS of .868. There are three catchers in the entire league (minimum 190 PA) who posted a higher OPS: Geovany Soto, Buster Posey, and Joe Mauer. As the crown jewel in the CC Sabathia trade of 2008, Indians fans are still waiting for Matt LaPorta to replicate his minor league success at the next level. LaPorta has hit just .221/.306/.362 in 425 plate appearances. His batting average on balls in play was also pretty low at .250. A large reason for this is his weak percentage of line drives hit. Just 12.5% of the balls in play off LaPorta’s bat were line drives – the third-worst mark in baseball (minimum 400 PA). It is no secret that line drives are the type of batted ball that tends to fall for a hit the most often. Still, LaPorta’s minor league track record suggests power potential, and he should start right from Opening Day next season. He’s worth a shot in deeper leagues. For more on Carlos Santana and the Cleveland Indians lineup, check out Bloomberg Sports’ Fantasy Kits. A year after making the biggest splash(es) on the free agent market, the New York Yankees went a different route this off-season. One of the biggest moves of the off-season was a three-team, seven-player trade that landed Curtis Granderson in the New York Yankees’ outfield. Granderson, 29 next month, is now tentatively penciled in as the number-two hitter in a talented Yankees line-up. After hitting 19 home runs in 2006, his first full season, Granderson posted back to back 20-plus home run seasons in 2007 and 2008, then reached the 30-HR plateau for the first time in 2009. For comparison, the major league average for outfielders was 19 in 2009. Take a look at Bloomberg Sports’ time-line based trend chart (bottom right). There are some concerns about Granderson’s declining batting average (career-high .302 in 2007, .280 in 2008, full-season career-low .249 in 2009). But Granderson has maintained a selective approach, pushing his walk rates over 10% in each of the past two seasons. In addition to the walks, he is due for some positive regression on balls in play. Granderson’s career batting average on balls in play (BABIP) is .323. That’s a little above the league average, but not extraordinarily high for a player with good speed. In 2009, though, his BABIP fell to just .276. Expect that number to rebound this season which would in turn improve his batting average. 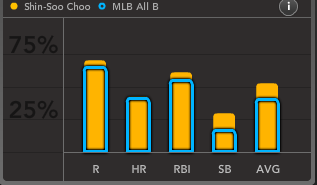 Another area of concern is Granderson’s platoon splits. For his career, Granderson has hit an impressive .292/.367/.528 (AVG/OBP/SLG) against right-handed pitching, but just .210/.270/.344 vs. lefties. Last season showed an even more extreme split: .275/.358/.539 vs. RH, .183(! )/.245/.239 vs. LH. Still, several baseball analysts have argued that when a player’s platoon splits are as extreme as Granderson’s, there’s plenty of room for regression on both sides. A true left-handed pull-hitter, Granderson’s slashing, line-drive power is a perfect match for his new home. Yankee Stadium fueled huge numbers for power hitters last year, especially left-handed pull hitters. In 2009, Comerica Park had a home run park factor of .974, the 18th-best figure for hitters in the majors (1.000 is neutral, meaning home runs were suppressed by 2.6%). The launching pad in the Bronx sported a home run factor of 1.261 (i.e. 26% above average), tops in all of baseball. 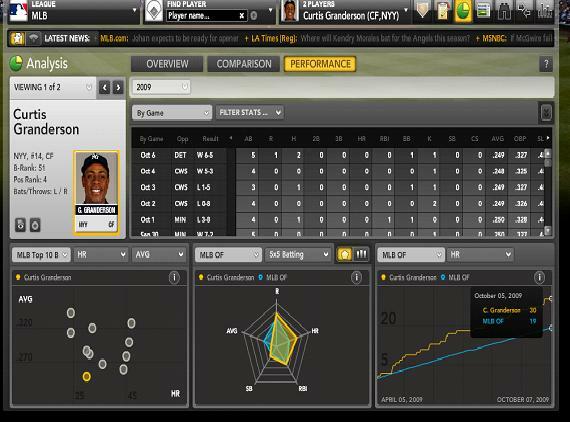 Looking at Granderson’s power numbers to each field further supports this theory. For his career, Granderson sports a slugging percentage of .510 on line drives and flyballs hit to left field, .556 to center field and a huge .744 to right field. Granderson’s home run-to-flyball ratios tell a similar story. Again moving from left to right field, here are his career HR/FB%: 4.4%, 5.9%, 29.1%(!!!) Nearly one in every three fly balls hit by Granderson to right field have gone for home runs in his career – and that’s without the benefit of Yankee Stadium’s friendly confines. Of course you can’t mention Granderson without the player he is replacing in the Yankee lineup, Johnny Damon. Like Granderson, Damon’s slashing, left-handed swing was a perfect match for new Yankee Stadium. In his first and only season at the ballpark, Damon tied a career-high with 24 home runs and set a career high in isolated power (slugging percentage minus batting average). Playing at old Yankee Stadium in 2008, Damon posted a .684 slugging percentage to right field, with a strong 23.5% HR/FB rate. In 2009, those numbers rocketed to .859 SLG and 31.5% HR/FB to right field. Once we factor in age, defense, contract and the likelihood that Granderson might have more natural power than Damon, you can see why the Yankees made the switch. 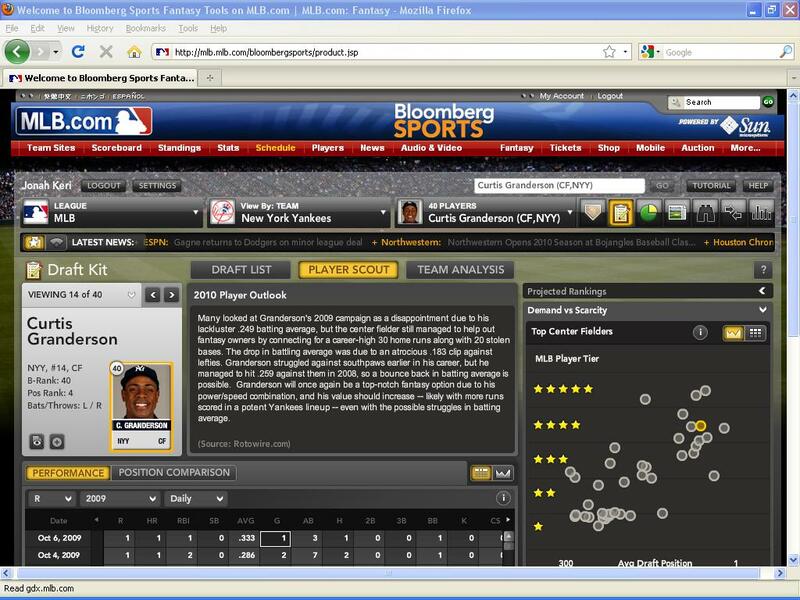 Currently, Granderson’s average draft position (ADP) is 56. His B-Rank of 40th overall suggests this is quite a bargain. Looking at the Demand vs. Scarcity chart, you’ll notice that Granderson is in the fourth tier of center fielders. Just to the right of Granderson’s yellow dot is another dot also located on the fourth-tier; this belongs to Grady Sizemore. Currently, Sizemore is being drafted around 13th overall, 43 spots before Granderson. However, Sizmore’s B-Rank of 32 pegs his value just eight spots ahead of Granderson. This means you can pass on Sizemore early, wait until the fourth or fifth round for Granderson, and still receive similar production. With the expected increase in home-park influenced power, potential BABIP regression, and being in the middle of his perceived physical prime, Granderson’s 2010 season projects to be his best yet. Throw in Granderson’s average of nearly 20 stolen bases a year since ’07 and his impressive blogging skills and you have a must-get player. Draft the man. For more information on Curtis Granderson and hundreds of other players, and for dozens of tools to help you dominate your fantasy league, check out Bloomberg Sports’ fantasy kits.